As the calendar flips to October, fans and bettors of college football don't have to wait very long to get their fix in after the weekend card. Last night, Arkansas State and Georgia Southern played in the first Wednesday game of the year, and it had everything a fan could want - tons of yards, a boatload of points and a cover by the favorite. If you thought that game was high-scoring, wait till you see tonight's lone college game between the No. 17 Louisville Cardinals and the No. 24 North Carolina State Wolfpack. The Cardinals are currently three-point road favorite with the total set at 65.5. I believe this game will be much closer than last year's meeting, which ended in a 54-13 blowout for Louisville. Tonight's game should make up for the lack of quality games on tomorrow's card. In the first game, Memphis (-13.5) travels to East Hartford to take on Connecticut in an AAC East matchup. The second game sees Boise State (-8) travel to Provo to tangle with BYU. The Cougars will be looking to snap their current four-game losing streak. From a Top-25 perspective, Saturday's card features just one game between ranked opponents. The 23rd-ranked West Virginia Mountaineers take their 3-1 record on the road to Fort Worth, Texas to tangle with the No.8 TCU Horned Frogs. The Frogs are currently laying 13.5 points, and the total is set at 68. I feel as if the rest of the Top-25 have very tricky games on deck in their respective conferences, and I would not be surprised to see another three ranked teams suffer defeats at the hands of inferior opponents. Last week I was able to keep the momentum rolling and cash two more picks to bring my record to 7-4 for a profit of 11.1 Units. This week I have two "under-the-radar" games from the Saturday board that I expect the get the job done. I will use $100 as my unit of wager, and, as always, all lines are courtesy of our friends at 5Dimes. To keep the momentum rolling this week, I am going to focus in on the Sun Belt Conference. The Sun Belt is one of the conferences that I feel can be profitable on a weekly/yearly basis if you put in the time and effort to follow these teams closely. In this matchup, I believe that getting less than a field goal with the home dog is the way to go. Normally, I would shy away from spreads like this, but Coastal Carolina should be pissed off coming into this week, and I expect them to take their frustrations out on a bad Georgia State team. Sure, last week's scoreboard says Coastal Carolina lost 51-43 to UL-Monroe, but the score was hardly indicative of what actually happened. The Chanticleers outgained UL-Monroe by more than 100 yards, including by 200 yards in the passing game. They also won the time of possession. Their downfall was the turnovers and special teams play. I believe they get that corrected this week. Georgia State, on the other hand, should be a bit rusty after having their game against Memphis cancelled last week. The Panthers aren't the kind of team that gets better with time off. This is a young, inexperienced team, and practice can only prepare them so much before live action throws everything for a loop. Coastal Carolina will not only have the best quarterback and running back on the field, but they also boast the better defense despite the recent performances. They should have no problems containing a Georgia State offense that is averaging a mere 12 points per game. I think the wrong team is favored in this matchup, and I fully expect to be cashing this ticket come Saturday night. For my second selection of the day, I am sticking to the Sun Belt conference for a game between the UL-Lafayette Ragin' Cajuns and the Idaho Vandals. The Vandals come into this game after using their bye week to get rested/healthy on the heels of a much-needed double overtime win against South Alabama. That brought their record to an even 2-2, and I fully believe this is the game they get half way to a bowl game and securing their third win of the season during homecoming week. 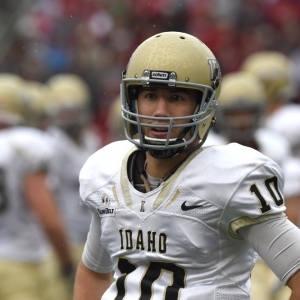 The Vandals are led by QB Matt Linehan, who has thrown for more than 200 yards in each of his last three starts while tossing five touchdowns to just one interception. The offense, which has always been the achilles heel of this program, is starting to develop into a productive unit that feels confident they can score every single time they have the ball. I believe the Vandals match up well against the Ragin Cajuns in terms of the passing attack versus the pass defense. The Ragin Cajuns give up more than 560 yards per game to opposing offenses, and that includes six yards per rush and nearly 11 yards per pass. If the Vandals can control the time of possession and play turnover-free football, they should be able to move the ball with ease and put up plenty of points. On the flip side, the Vandals defense should be tested against a Ragin Cajuns' offense that is averaging 30 points per game on the road. I should note that those games have come against Tulsa and Texas A&M - not exactly the greatest defenses in the world. The Vandals are holding teams to just 357 yards per game, so scoring against this experienced defense is going to prove to be a tall task. Pick: 2-Unit Play on #358 Idaho (-6.5) -110 .